formal, in their Sunday best. …In many late 19th-century art publications, Goya was considered a democratic engagé, an artist of the people. A royal portrait commission like The Family of Charles IV troubled these expectations of an independent artist freely choosing his subjects and painting without having to cater to sitters’ demands. Seeing the portrait as caricature, however, fit nicely with the critics’ belief that Goya was, at heart, a republican, not a monarchist…. In nineteenth-century Spain, Goya’s paintings and the Family of Charles IV, received mixed commentary, but were never compared to caricature. The painter, restorer, and critic Ceferino Araujo Sanchez disparaged Goya’s painting in an important publication on Spanish museums….Araujo Sanchez specifically stated that the Family of Charles IV and The Third of May, 1808 were not Goya’s masterpieces. The low esteem in which Goya’s royal portrait was held may be reflected in an 1863 photographic catalogue of works in the royal museum (not yet called the Prado), which did not include this or any other work by Goya…. Alisa Luxemberg, “Further Light on the Critical Reception of Goya’s Family of Charles IV as Caricature,” Artibus et Historae, vol. 23, no. 46 (2002): 179-81. 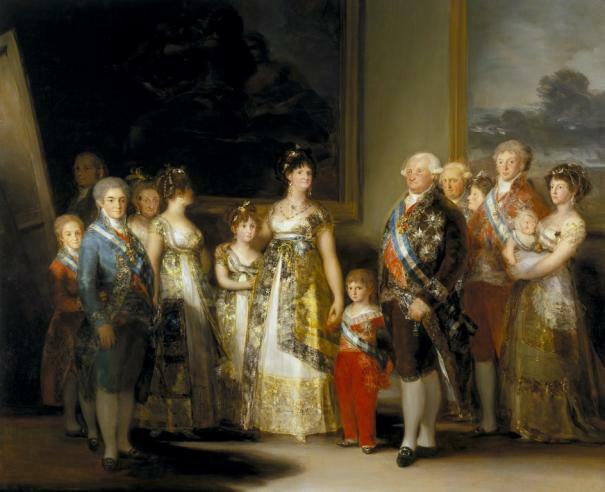 Fred Licht, “Goya’s Portrait of the Royal Family,” The Art Bulletin, vol. 49, no. 2 (June 1967): 128.